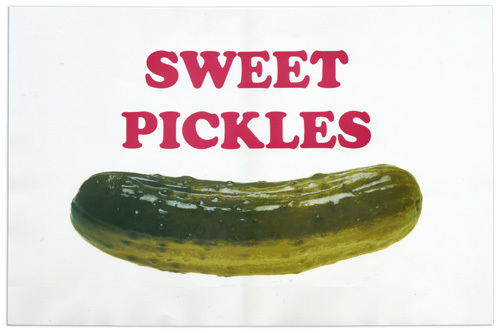 This is my new favorite exclamation / fake curse word / catchphrase. Try it for yourself – it works every time. Monster Dan is my sister Mollie’s boyfriend, and this portrait was part of a set that I gave her as a birthday present. Dan has “always alarmed” eyes that he uses to stare down his students (he’s an English teacher) and of course a Conjunction Junction button that I bought off of eBay. 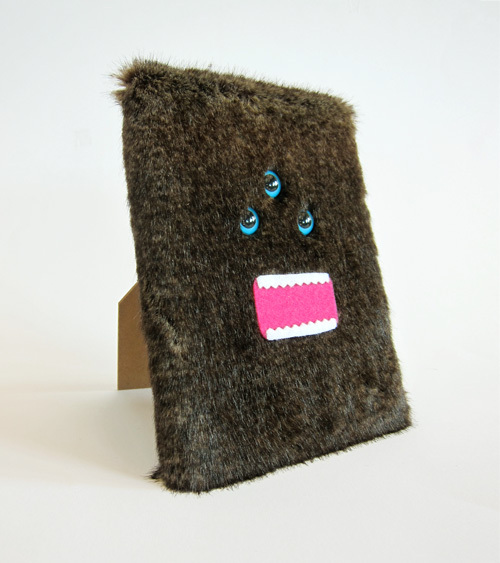 Monster Dan measures 5.5 x 7.5 inches and was made using 39 cent felt squares, googly eyes and faux fur fabric wrapped around the back/stand portion of IKEA’s Ribba picture frame. 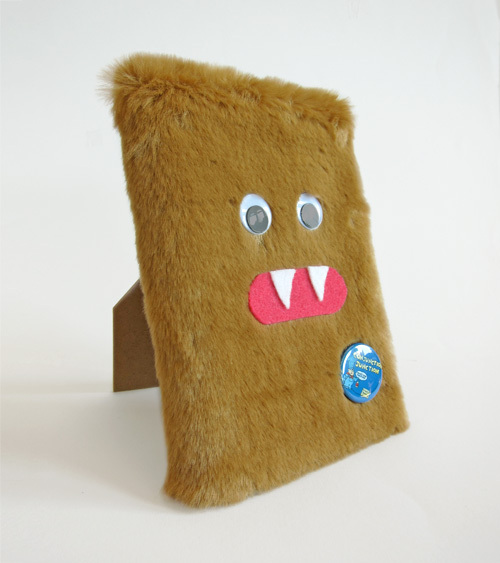 The stand was left over from my original monster portraits, which only used the frame portion. Here is a nice little ditty I worked on for the Portland Timbers soccer team thru Jelly Helm Studio. I’m not the biggest sports nut around, but I do appreciate the talent and dedication it takes to play a game well. The part that usually rubs me the wrong way is the untouchable icon status that sports figure often inhabit. As my dad would say, “They put their pants on the same way as you do, don’t they? One leg at a time?” Sure enough. 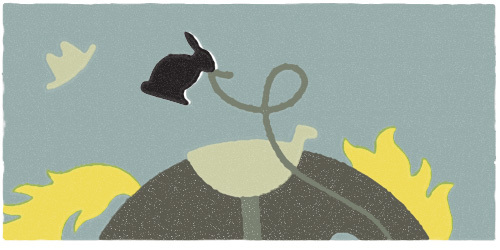 So when I was working on this piece, I was pleased that the tribute giving was going both ways. YES, the players are fantastic. YES, the fans are also fantastic. THANK YOU to the whole Timbers community for being what you are, and for the exchange being two way, three way, four way, the best way. Click the image to zoom in on the notes of thanks from the Timbers soccer team. Monster Mollie is my sister, and I made her this monster portrait for her birthday. Dark brown hair and piercing blue eyes (with an extra eye added just for good all-seeing measure) sit above her bear trap chompers. Don’t want to get in the way of those while she’s arguing or going for the last slice of pie. 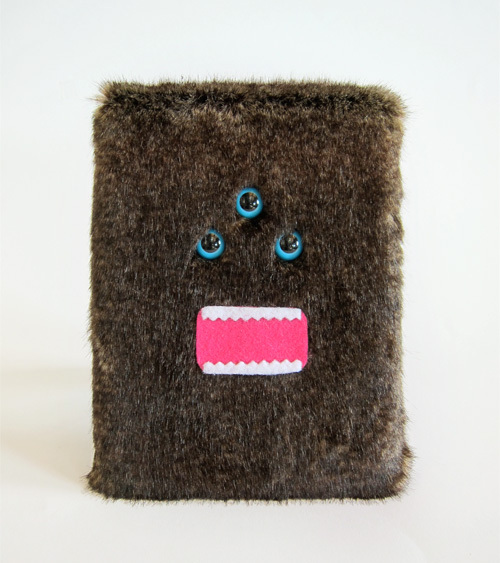 Monster Mollie measures 5.5 x 7.5 inches and was made using 39 cent felt squares, stuffed animal eyes and faux fur fabric wrapped around the back/stand portion of IKEA’s Ribba picture frame. 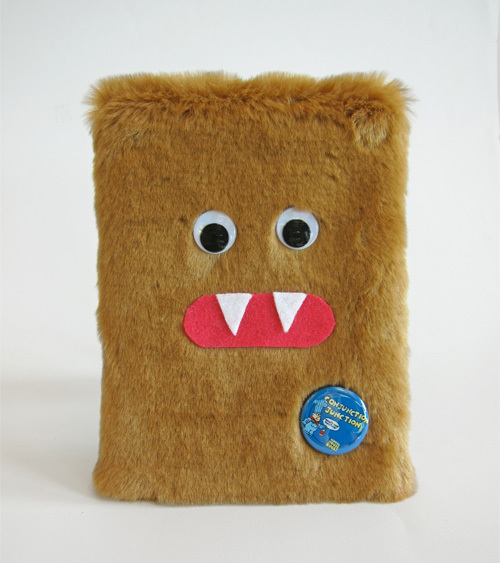 The stand was left over from my original monster portraits, which only used the frame portion. As a follow up to the business cards I designed for Jelly Helm Studio, here are some additional cards that show a little bit about how the studio approaches things. All of the cards were letter pressed on cream colored Neenah Classic Crest #165 cover. 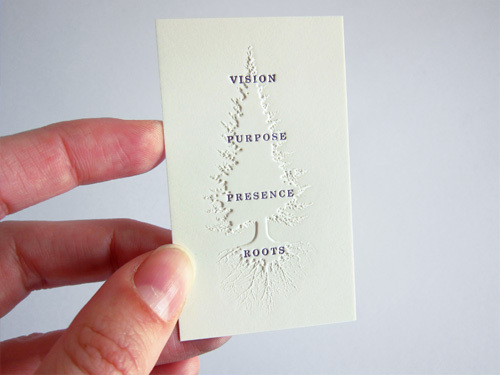 The cards were printed at Brown Printing, where they were very helpful in trying out an unusual combination of printing techniques: first embossing (raising) the paper in a tree shape, and then letter pressing text (pushing the paper down) on top of the tree shape. For all that pushing and pulling of paper with the text being pressed into both the tree and non-tree area, it turned out pretty well. A very advanced "who, what, where, when, how" diagram. 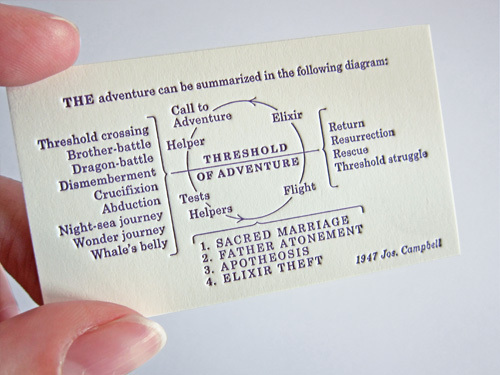 My favorite of the three cards is this reproduction of a diagram by Joseph Campbell. Wikipedia says “…his work is vast, covering many aspects of the human experience”. No small task to fit onto a 1.75×3 inch card, even with some rejiggering on our end so the large original diagram translated well to a tiny version of itself. 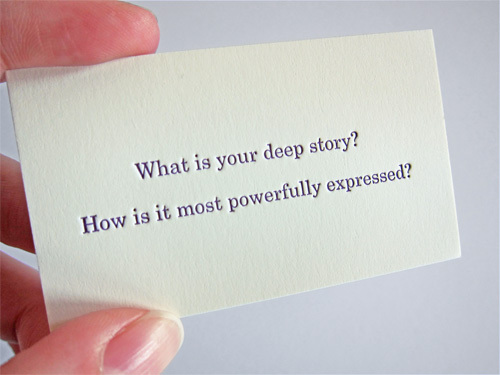 This should get you through most situations. Earlier in the year I had the pleasure of meeting some new designer acquaintances who were on a travel adventure across the USA. 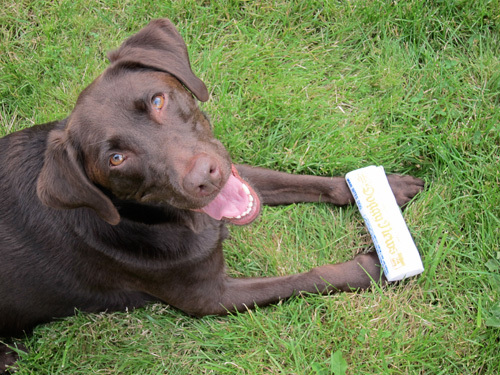 When Nathan Strandberg and Katie Kirk of Eight Hour Day made a stop in Portland, we bonded over our chocolate labs on a rainy day spent walking the dogs at Thousand Acres on the Sandy River Delta. Eli: no mischief here, no sir, not at all. While the Northwest weather may have driven Nathan and Katie on to their next destination with haste, their pup Eli and my pup Lucy didn’t seem to mind the rain, mud and driving wind that makes Portland fall something special. Those labs seem to have an unwavering love for life that shines thru so clear that it makes it easy to put up with some of their eccentricities. Lucy: the face that could trick you into just about anything. 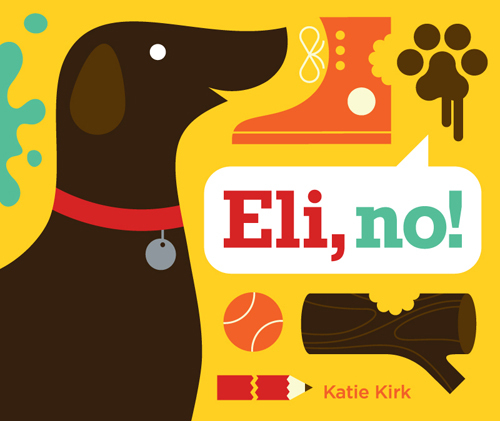 So when Katie wrote and illustrated the book Eli, No! 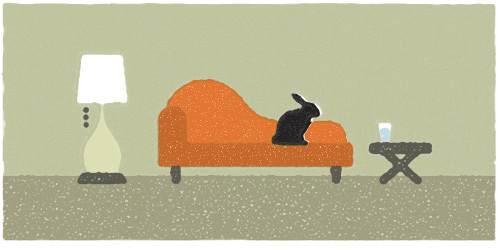 about her faithful companion’s shenanigans, it all felt very familiar. 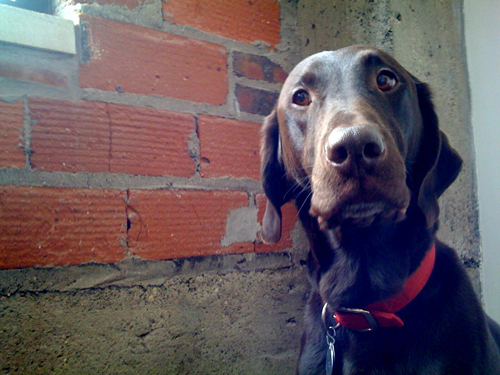 If I had to write a book about my dog pal, it would be titled LUCY, YEEARRRCHHHH! because that is the pterodactyl noise that I make when she is doing something inappropriate. It’s not the most endearing sound to come from a human, which is why you probably won’t be seeing a sequel from my neck of the woods anytime soon. Instead, I’ll just use Katie’s book to relive Lucy’s less glorious moments. Katie loves her dog, so she wrote a book about him.